Remember when you would get a birthday card in the mail with confetti inside and it would spill out all over the floor? OH Boy what a mess! This card that we made yesterday at club has wonderful, beautiful confetti but it's all enclosed inside one of our clear envelopes for a neat little snowstorm of colorful paper without the mess! Shake, Shake, Shake and you have a Kaleidoscope of color mixing before your eyes. Look at how tiny those little squares of paper are? You think I cut all those one square at a time? NO WAY! Stampin' Up! 's new fringe scissors took some of my paper scraps and with 2 snips (yes TWO!) I had a pile of little squares. Do this to each color and Voila', confetti. Cut one way then cut across your fringe to achieve the desired little squares. After you fill your clear envlope with the desired amount of colorful confetti (I cut mine down to 3" x 3") seal it off with some washi tape. Watercolor Wonder Designer Washi Tape is what I used because I love the gold in it. It just screams Birthday Celebration to M.E.! Let me tell you a little bit about these fringe scissors and why you need them. They are only $9.95! What are you waiting for? Go get yours now here! I added some birthday banners with the banner punch you can earn for FREE during Sale-A-Bration and tied a couple of knots with the matching gold bakers twine. I stamped Happy Birthday from the Big Wish Stamp Set #133092 Wood Mount and #133095 Clear Mount and from the same set I added the tiniest, cutest little birthday candle to each of the banners to finish this card off right, did you see it? I'm going to tell you something I rarely admit. Are you listening? I really didn't like this Designer Series Paper Pattern that I used behind this card. It was more than didn't like but my mother always said "We do not HATE" I supposed we could dislike. So I disliked it...a lot! Then one day last week I was thumbing through the pack again contemplating and my daughter who is 15 walked by my shoulder and she said "Stop!, I LOVE that paper!" Wait? What?! Really? It gave me a completely different perspective for this paper. Maybe it was one that others really did love. I needed to play with it. I do like the black on it so let's start with that. Black hmm Well, I do like the chalkboard technique that was so big just a few months back using Black Cardstock. Maybe this paper is perfect for that technique. I think so. Ok, my dislike has turned to tollerate. Well, Birthday stamp these days to M.E. means banner which is HOT NOW! and FREE NOW! along with this lovely twine. So now I have gone from tollerate to kinda like this...I don't know that it's LOVE but I do like it...a lot. What do you think? Leave me a comment so I know if you are with M.E. or the other group. Be honest! I really want to know, it will help me in my business the next two months as I present this Sweet Sorbet Paper in my workshops. I will randomly pick one comment to receive a copy of this card in their mailbox so leave a comment and then check back in to see if you won! Congratulations Faye a card is coming your way! There are times when a simple card just says it all. I think this is one of those times. Take a look. This was one of the cards that we made last night at our All Group Demonstrator meeting. It is a Blushing Bride layer embossed with Decorative Dots on a Very Vanilla Card base. It's not a conventional size but a square 4.5" x 4.5" size card. I added a lace doily on top of the layer with some of the Chevron ribbon out of our Occasions Catalog. Stamp the You're Lovely image and punch it out with the 1 3/4" Circle punch and layer all of that on a Perfect Plum Scallop Circle which is popped up on a couple of Stampin' Dimensionals. A few brushstrokes with a couple of Stampin' Write Markers of your choice and Voila' the card is complete. It is a pretty card to tell someone that you think they're lovely! Why not create your own version and share it with that special someone? Looks like we have the next Snow system getting ready to hit us hard. I am sitting here just hoping I have time to get out and go to bowling today and rush home before it gets too horrible! It's not so much for the activity of bowling, although I like it, but more for the friendships I have made with this great group of ladies. I really enjoy the laughter that is inevitable when we are together. I can feel this post being rather random in it's content but my thought is that you will be able to see the real M.E. and my daily life, you know, the things you do with friends! So it's 8:30am and I have already cleaned the kitchen after cleaning out the fridge and noticing I had 5 over ripe bananas. So I have already baked 2 cakes this morning. Yep TWO! Remember I have bowling today so one is going with me. I just can't decide, do you take the tried and true, or do you take the new to you recipe? Leave a comment and let me know what you do? I am guessing with Pinterest the responses may be different than they were a few years ago. One is the usual banana cake with cream cheese frosting (YUM) one is my friends mom's recipe, the bundt cake with crushed pineapple. Again sounds yum but I have never made it so worried and I am one of those who hates to take the cake with a bite out of it! Ha Ha. Stay tuned to see what I decide to do. So many fantastic products at fantastic prices. You don't even need to leave where you are right this minute. Just click on this link to shop now. I hope this post finds you warm, loved, and inspired. Let's Sale-A-Brate!~It's TIME for FREE STAMPIN' STUFF! Can you see M.E. doing the Happy, Happy, Happy Dance? Why am I doing the Happy Dance? Because today starts the BEST time of the Stampin' Up! year. What is Sale-A-Bration? Its where EVERYONE, anyone who orders $50 in merchandise gets to pick an exclusive item from the Sale-A-Bration brochure and let me say this year the items are OUTSTANDING! Just look at the card I created just for you from a few of the FREE items you can earn. The Stamp Set is called "See Ya Later", The Designer Series Paper is called "Sweet Sorbet", the twine and cork accessories are from the Sweet Sorbet Accessory Pack (oh boy these are a secret waiting to be revealed!) and lastly the Summer Starfruit paper was embossed with the Decorative Dots Textured Impressions Embossing Folder. All items you can earn for FREE by just placing a $50 order from M.E. or want to earn it all? Host a Stampin' Up! workshop with your friends and earn all of these products and SO much more and have a Fantastic fun Stampin' Experience in the privacy of your home. Contact me to schedule your Workshop/Private Party in your home or mine. 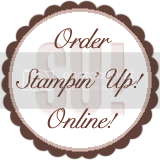 Lastly I will also mention that if you want to get $150 worth of Stampin' Up! product for $99 because you have a HUGE wishlist Sale A Bration time is the best time to join my team. Contact me for more information or ready to jump right in with your list and then earn the rest of it for a discount? Go to my Website to sign up: http://www.stampinup.net/esuite/home/createwithme/jointhefun and click on the "Join Now" banner. I also want to share this fantastic new product that just came out today. Many of you have asked me about my Texture Boutique Embossing Machine and now you too can own your own. Add this to your collection of Stampin' Tools today! You're "Peachy Keen"~Don't change a thing! I'm head over heals in love with this new Designer Series Paper called Watercolor Wonder #132994. It is so beautiful and frankly versatile and what papercrafter doesn't love paper that can do it all! The look is soft and the designs are anywhere from Chevron to dots to florals. I NEED it ALL! First I came up with this design, or one very close to it, for a local swap my group held. I really like this card. The DSP layer is popped up with lots of dimension, that is what makes it so pretty. I stamped the greeting from the Peachy Keen stamp set #133110 wood and #133113 clear in Calypso Coral. The Petite Petals flower #133152 wood and #133155 clear are punched out using the matching Petite Petals Punch #133322 which I LOVE! Let's be frank here...who really loves to "fussy cut" out anything? I mean if we loved to FUSSY CUT we wouldn't have punches, die cuts and electronic cutters. Right?! That is my story and I am sticking with it! FUSSY coloring yes! FUSSY cutting oh NO! The few small additions were a change in the layout from landscape to portrait, the added stitched ribbon, a change in colors and the dotted dimension near the bottom which was added with the Decorative Dots Texture Impressions Embossing Folder #133520. This is an item you can only receive for FREE January 26th-March 31st for ordering $50 in Merchandise during our big Sale A Bration event. Prize Alert, Card GiveAway: Comment on this post below and I will randomly pick on person to receive the top card in the mail! I will randomly pick a winner on Wednesday January 22nd. Thank you for commenting. After doing a random Integer generator the number was 4. So Mary Roberson make sure you email me your mailing address! Congratulations Mary I will put this card in the mail for you as soon as I hear from you!